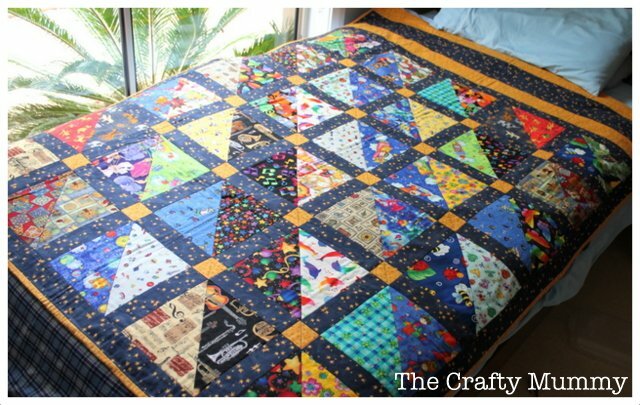 "My kids each have a quilt that sits on their bed and this is the one that I made for Mr Happy. It is called an I Spy Quilt because there is a collection of novelty prints that encourage kids to look for things or play “I Spy” with it. It is bright and colourful and fun. I made it a couple of years ago but I thought I’d share the pattern. 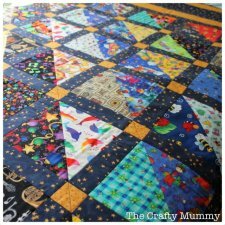 I used a dark navy print between the bright blocks, but this would also look good with a solid colour for the strips or white strips. The strips at the top would also look great in the favourites of your novelty prints or even a border print."